I am completely, irreversibly, hopelessly in love. I am in love with Goa. It was love at first sight. My first sight of Goa dates back to some twenty years. I was doing my post graduation and had to attend a Conference in Hyderabad. Now Hyderabad is quite a distance from Goa but we (that is me and a couple of friends of mine) managed to convince our boss that the journey from Patiala to Hyderabad took three days by train instead of the actual thirty six hours and thus armed with extra three days of leave and a circular railway ticket for Delhi- Hyderabad- Bangalore- Goa- Bombay- Delhi we set forth on our journey. On the third leg of our journey we took the night train from Bangalore to Goa. My first memory of Goa is the sight of the magnificent Dudhsagar falls. The waterfall is set amidst thick forested landscape and the water plummets downwards with such force that it appears milky white from a distance thus giving it the picturesque name. The train stopped at Molem station and a number of vendors selling cold drinks (or so I thought) in buckets full of ice appeared. When they reached me I realized that they were selling beer. You can imagine the shock and awe that generated. I have encountered a guy selling country made pistols in a train when passing through Bihar but my first encounter with the business sense of the Goan is a far better memory. The sight of Dudhsagar fall through the train window with a bottle of chilled kingfisher in my hand was enough to make me fall in love with Goa and the bond has only strengthened since. And my first look at the Arabian Sea! People who have never seen the sea will find it difficult to imagine the feeling as it is better experienced than imagined. The experience of standing on a lonely beach, the feel of sand below your bare feet, the sound of crashing waves in your ears and the unending expanse of blue in front of your eyes while feeling the salt tinged breeze on your face is one which makes you feel at peace with yourself. And mind you, Goa is not all about blue waters, golden beaches and bikini clad babes. The languid air of relaxation, of taking things one at a time, the feeling of being away from the rat race generates a kind of Zen, a feeling which the Goan call susegad. Goa has a lot to offer to the bird watcher, the wildlife enthusiast, the angler or the adventure sports lover. A small state of a few hundred square kilometers, it has the restless sea, golden beaches, lazy rivers, wild waterfalls, Blue Mountains, green forests and fields of paddy. Wherever you go you will find the ubiquitous coconut palms, the beautiful houses with the sloping roofs and churches and chapels. Another constant presence is of the wine shops. 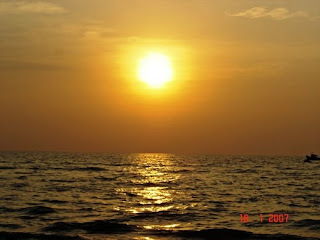 Goa is the tipplers paradise but it is very rarely that you will find a bona fide Goan creating a scene after drinking. It is mostly the tourists (that too from my part of the country) who are responsible for the instances of drunken indiscipline. I keep reading about the ugly underbelly of Goa which involves drugs, pedophilia and sundry other crimes but I have encountered nothing of that sort in my ten odd visits. I am sure these problems exist but they are well hidden from the ordinary tourists like me. And the food! I could fill reams of paper describing the mouth watering delicacies on offer. But it will be sufficient to say that I put on around 2 kgs for every week I spend in Goa despite the rigorous physical exercise. In addition to the famous eateries many small unknown shacks and restaurants provide the best food in this world. If you are a vegetarian, you will survive but the true gastronomic pleasures await the carnivores. One day, I keep promising myself, I will buy a small house in Goa by the side of a river, ( I can’t afford a house on the beach anyway), install a state of art home theater, buy the DVDs of all the movies I have to see, plug in my world space receiver, and go live there permanently with all my books and crates of beer. There will be a spare bedroom for friends who would like to drop in. Would you like to be there, my friend?